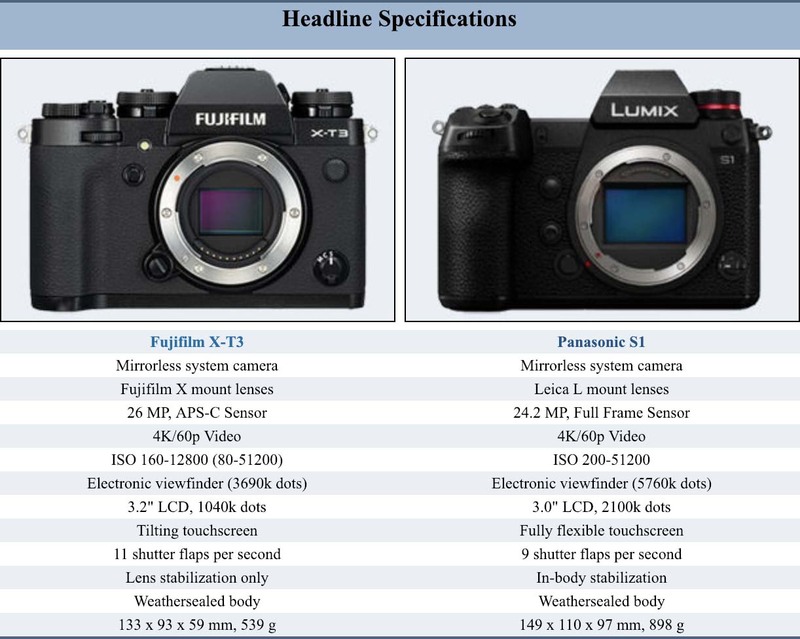 The Fujifilm X-T3 compares very well to the Panasonic S1 and it is significantly lighter. Apotelyt hasn’t added their size comparison photos yet, but they should be up soon. I hope we get to see the new 5760k dot viewfinder in the upcoming Fujifilm GFX100 and Fujifilm X-H2. You can follow it’s launch at 43addict if you’re interested. The official announcement is expected within the next 24 hours. Faster burst: Shoots at higher frequency (11 vs 9 flaps/sec) to capture the decisive moment. More compact: Is smaller (133x93mm vs 149x110mm) and thus needs less room in the bag. Less heavy: Is lighter (by 359g or 40 percent) and hence easier to carry around. This entry was posted in Fujifilm X-T3 and tagged Fuji GFX, Fuji GFX 100M, Fuji GFX 100S, Fuji GFX100M, Fuji GFX100S, Fuji Rumors, Fuji X-H2, Fuji X-T3, Fuji X-T4, Fuji X-T4Pro, Fuji X-TPro, Fuji XH2, Fuji XT3, Fuji XT4, Fuji XTPro, Fujifilm, Fujifilm GFX 100M, Fujifilm GFX100M, Fujifilm GFX100S, Fujifilm Rumors, Fujifilm X-H2, Fujifilm X-T3, Fujifilm X-T3Pro, Fujifilm X-T4, Fujifilm X-TPro, Fujifilm XH2, Fujifilm XT3, Fujifilm XT4, Fujifilm XTPro, FujifilmRumors, Fujirumors, GFX, GFX 100M, GFX 100S, GFX100M, GFX100S, Medium Format, Super Full Frame, X-H2, X-T3, X-T4, XH2, XT3, XT4. Bookmark the permalink. Trackbacks are closed, but you can post a comment.